Joplin, Missouri Tornado: How Can You Help? The Missouri State Emergency Management Agency is providing details on donating and volunteering to help Missourians recover and rebuild. Health professionals interested in volunteering are asked to sign up on the Missouri Department of Health and Senior Services Show-Me Response website. 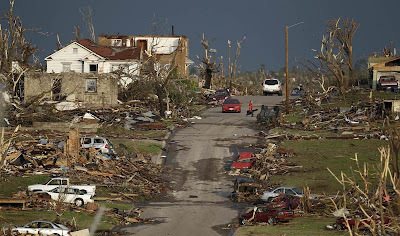 The American Red Cross has opened shelters in Missouri and Minnesota. The shelter in Joplin is located at Missouri Southern State University, and the Red Cross is working to provide transportation to the shelter for those in need. The Red Cross is also distributing food, cleanup supplies and comfort kits, and sending health workers to provide immediate care. Text "REDCROSS" to 90999 to make a $10 donation, or visit the website to donate, give blood or volunteer. AmeriCares has sent disaster-relief personnel to Joplin, and it's working with Access Family Care Clinic to help victims.Donations to AmeriCares can be made online or by phone at 1-800-486-HELP.The disaster-response team with Convoy of Hope is heading to Joplin with a truckload of water, snacks and ready-to-eat meals. Those wanting to help can text the word "CONVOY" to 50555 to make a $10 donation. You can also donate online or by calling 1-417-823-8998. Our thoughts go out to everyone affected by this disaster. Do you have any examples of Girl Scouts helping communities following the tornadoes?